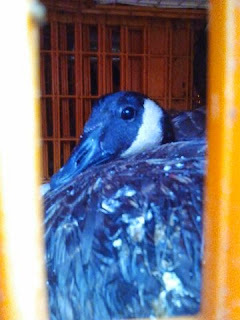 Tales, Tails and Feathers of New York -- PCA: Pity Party for USDA "Wildlife Services"
One of 23,000 Canada goose victims last year of USDA "Wildlife Services." Lord have mercy and pity for our hard working folks at Wildlife (Extermination) Services. Happening in New York City tonight (Thursday) from 5:30 to 7 PM. But, perhaps we are being too hard on our poor hard working folks at Animal Plant and Health Inspection Services (APHIS)? Mr.Shea spends the first two self-pitying paragraphs complaining how WS has been unfairly "maligned" in recent newspaper articles (particularly, the Washington Post) and how these same papers neglect to publish his letters in their entirety. -- Wow, life is hard! Mr.Shea is particularly distressed that some organizations and media report more than 4 million animals killed by WS last year. Asserts Mr. Shea, "3.5 million" of those animals were birds! Apparently, Mr. Shea doesn't truly consider birds to be animals. Continuing the impassioned defense of his "unfairly criticized," bread and butter agency, Mr. Shea assures stakeholders that APHIS is "fully transparent about all of WS's work, both lethal and non-lethal." That is only partially true. They are transparent AFTER the slaughters have occurred and WS writes up their reports on them. But, for those wanting to know beforehand where and when WS wildlife killings are slated to happen, well, good luck on that one. One may as well ask when the next asteroid is due to hit earth. Moreover, were WS "transparent" as Mr. Shea claims, members of the public would not need to do Freedom of Information requests in the first place. But, even when they do, much of the requested information is redacted (such as locations of where geese were gassed or slaughtered). In New York City, for example, we still don't know where our geese are sent for death or in fact, how they actually die despite Freedom of Information requests. Mr. Shea conveniently omits from his mournful, pity party letter, descriptions of USDA WS deliberately misleading community leaders, media and the public when promising one thing ("relocation of geese") and doing another (gassing the geese instead). Apparently, Shea and chums would like us to believe that a fairly large state could not accommodate 18 geese. 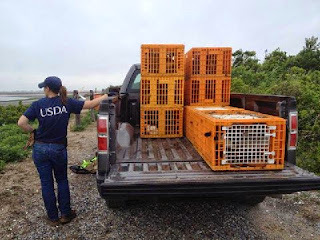 Or, that USDA WS is incapable of designing a plan for "relocation" of animals until the day they show up with trucks, boats, corrals and crates and suddenly announce to the community, "We could not find a place." Mr. Shea then attempts to divert from controversial topics to write about the "non-lethal" actions of USDA WS and how it represents "80%" of their actual work. But, no one was "criticizing" WS for their non-lethal efforts. Its the 20% represented by gassings, slaughters, trappings, shootings, and poisonings of millions of animals that is drawing the ire of the public, some media and a pitiful few members of Congress. Its also USDA WS's so called, "accidental" killings of non-target animals, including pets and endangered species that garners them criticism. In finally closing out this self-serving drivel, Mr. Shea tries to imply (or rather threaten) that unless the American public fully supports and continues to fund WS, we are all liable to die in a plane that hits a bird or from "contracting rabies" from a raccoon or skunk. Apparently the administrator is unaware that most airliners that hit birds either continue on the journeys unscathed or return to the airport (not so lucky for the birds though) and that there are vaccines for rabies. I was personally very moved by this touching and heartbreaking letter, though perhaps not in the ways Mr. Shea would desire. Rather, my heart bleeds for the 3.5 million birds killed by WS each year, in addition to more than a million other members of wildlife. Photo documentation below shows the goose following the truck containing his/her family members and according to witness, "honking in distress." As one poster on Facebook put it: "The goose probably would have elected to go with family, even to slaughter."